Born in Scotland, James Wilson studied at St. Andrews, Edinburgh, and Glasgow. He began preparing for the Presbyterian ministry, but had to withdraw from the University after four years because of family financial difficulties. After tutoring in a gentleman’s family, he began to learn merchant accounting and became determined to make his living in the secular world rather than in the church. 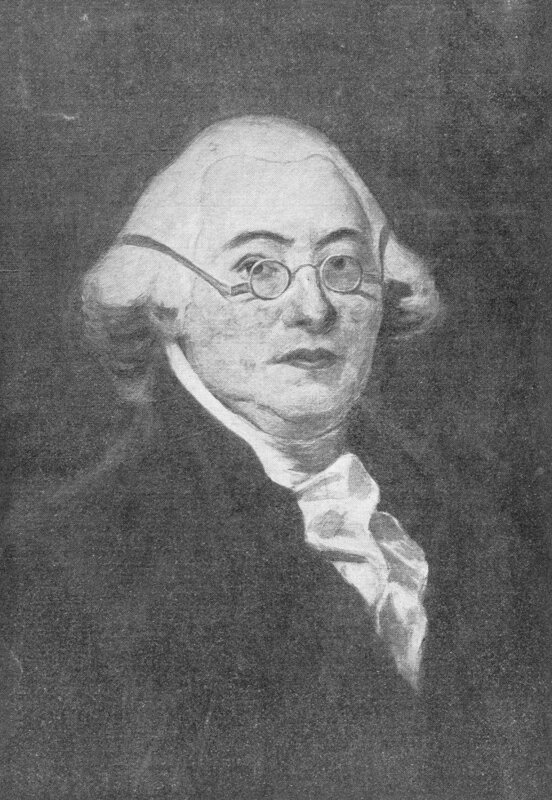 In 1765 Wilson came to America, where he was employed as a tutor in the College of Philadelphia (now the University of Pennsylvania). In 1766, while he was a tutor, the College awarded him an honorary M.A. He then spent a year studying law with John Dickinson before practicing law in Reading, Carlisle, and Annapolis. He married the heiress Rachel Bird in 1771; the first three of their six children were born in Carlisle. Wilson was a leader in Pennsylvania’s revolutionary activities. In 1774 he was elected to Cumberland County’s committee of safety and was that county’s representative to the first provincial convention. During this period he published a pamphlet putting forth his basic political philosophy that “all power is derived from the people” and that therefore Parliament had no authority over the colonies if the colonies had no representatives in that body. From 1775 until 1777 he was an active and respected member of the Continental Congress. A Whig rather than a radical revolutionary, Wilson was not eager for independence, but did vote for independence and signed the Declaration of Independence. It was during the American Revolution, in 1778, that Wilson moved his family to Philadelphia and became a member of the Philadelphia bar. Although he worked to raise money and support for the Revolution in Philadelphia, he also was driven to accumulate wealth for his family, engaging in land speculation and nail manufacturing as well as working with Robert Morris to gain the charter for the first national bank. Politically, Wilson believed not just in representative government, but also in the need for checks and balances on the potential tyranny of the majority. The views of this conservative revolutionary did not endear him to the more radical revolutionaries. Instead Wilson worked with the state Republican party to overthrow Pennsylvania’s radical, unicameral legislature and constitution of 1776. Eventually, in 1789 and 1790, he would become the main author of Pennsylvania’s new constitution which included a governor with limited veto power, a bicameral legislature, and an independent judiciary. As these Republicans built up support in Pennsylvania during the 1780s, they sent Wilson to the Confederation Congress in 1782 to 1783 and 1785 to 1787. Wilson argued for a strong national government, the concept of implied powers, and dual sovereignty of the states and the central government. These principles were not adopted in the Articles of Confederation, but helped lay the groundwork for the Constitution. It is not surprising that Wilson was an active and vocal member of the 1787 Constitutional Convention. His role in the framing of the Constitution was crucial, second only to that of James Madison. He also played a vital part in the successful ratification of the Constitution. Wilson saw the potential importance of the Supreme Court under the constitution and asked George Washington to appoint him its chief justice; much to Wilson’s disappointment, Washington did appoint him to the Supreme Court, but chose John Jay as chief justice. It was during the American Revolution, in 1778, that Wilson moved his family to Philadelphia and became a member of the Philadelphia bar. The year after his move to Philadelphia Wilson became a trustee of the College of Philadelphia (now the University of Pennsylvania). Later, at the time of his 1790 appointment to the Supreme Court, he became Penn’s first law professor and founder of the Penn Law School. Wilson had come to see teaching as the means for him to gain enduring recognition and to establish the foundation of the young nation’s legal system. His first wife having died in 1786, Wilson in 1793 married twenty-year old Hannah Gray, who would be the mother of his seventh child. His continuing economic speculations brought him increasing financial difficulties; he was imprisoned for debt in New Jersey in 1797 and in North Carolina in 1798, where he died that same year. Wilson was still a Supreme Court justice and a Penn law professor at his death, but his reputation had sunk so low that his remains were not returned to Pennsylvania for burial in Christ Church graveyard until 1906.